These Pet Rescue level 149 cheats and tips will help you beat level 149 of Pet Rescue. The objective of Pet Rescue level 149 is to save 2 pets and score 3,000 points. 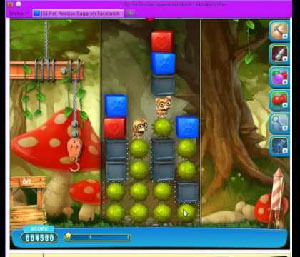 In Pet Rescue Saga level 149, as you clear the blocks more blocks are going to fall from the top. This makes it difficult to move down the board. Try to keep all the columns and levels on the board as even as possible. This will make it easier to make big color combinations. Once you get to your second pet, try to stack the metal blocker blocks on top of each other. Then, once the rocket booster is charged, activate the rocket in a column that has more than one metal block. This way you can clear multiple metal blocks in just one move. Once you have saved your two pets, you still need to reach a score of 3,000 points. If you have not done so by the time all your pets are rescued, continue to make large color combinations out of the remaining blocks and pokey balls. If you have a rocket missile booster available, you can use that as well.